Similar to Steppe Buzzard but tail longer and narrower with rounded corners. Head and neck narrower, protruding in cuckoo-like manner. Wing beats moe flexible.Soars on flatish, and glides on slightly lowered wings. Male has greyish head and upperparts, female browner. Below, colour varies between birds from blackish brown to almost white. Most are barred with large black carpalsTail has a dark band near the tip and two at the base. Cere grey, eyes yellow. Juveniles are dark brown, rufous brown or creamy white with streaked breast. Often but not always with dark carpal patches. Head often whitish with dark eye-mask. uppertail coverts whitish, pale band on greater underwing coverts often seperates secondaries from dark forewing. 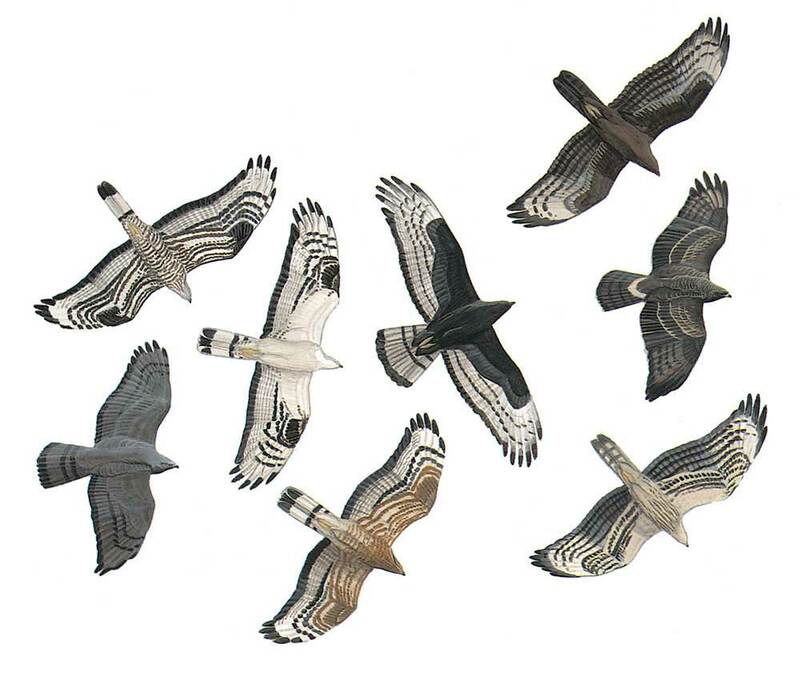 Slender, more curved wings and shorter tail than adult give juvenile a more Steppe Buzzard like outline, but shape of tail and head, wing position and wing action seperate it.